The Global Volcanism Program has no activity reports for Tecuamburro. The Global Volcanism Program has no Weekly Reports available for Tecuamburro. The Global Volcanism Program has no Bulletin Reports available for Tecuamburro. Tecuamburro is a small forested stratovolcano or large lava-dome complex of mostly Pleistocene age. It is located about 50 km ESE of Guatemala City, about 20 km S of the main volcanic chain. 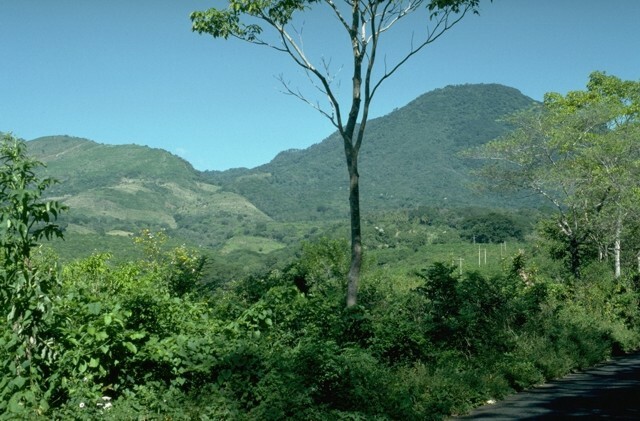 An ancestral andesitic stratovolcano, Miraflores, was formed about 100,000 years ago. Tecuamburro and other lava domes were constructed during the late Pleistocene or early Holocene within a horseshoe-shaped, E-facing caldera produced by structural failure of the older Miraflores prior to about 38,000 years ago. One of the largest of these domes, Peña Blanca, overtops the NW rim of the collapse scarp. Two nested craters, the larger of which is Chupadero, lie at the NW end of the complex. The smaller crater is a phreatic tuff ring, Laguna Ixpaco, that was formed about 2900 years ago during the latest dated eruption of the complex. Numerous fumaroles, hot springs, and boiling mud pots are found in the area around the acidic lake. No historical eruptions are known. Cameron B I, Walker J A, Carr M J, Patino L C, Matias O, Feigenson M D, 2003. Flux versus decompression melting at stratovolcanoes in southeastern Guatemala. J. Volcanol. Geotherm. Res., 119: 21-50. Duffield W A, 2001. At least Noah had some warning. Eos, Trans Amer Geophys Union, 82: 305, 309. Duffield W A, Heiken G H, Wohletz K H, Maassen L W, Dengo G, Mckee E H, 1989. Geology and geothermal potential of the Tecuamburro volcano area of Guatemala. Trans Geotherm Res Council, 13: 125-131. Duffield W A, Heiken G H, Wohletz K H, Maassen L W, Dengo G, Pinzon O, 1991. Geologic map of Tecuamburro volcano and surrounding area, Guatemala. U S Geol Surv Map, I-2197, 1:50,000 geol map. Goff S J, Goff F, Janik C J, 1992. Tecuamburro volcano, Guatemala: exploration geothermal gradient drilling and results. Geothermics, 21: 483-502. Heiken G, Duffield W, 1990. 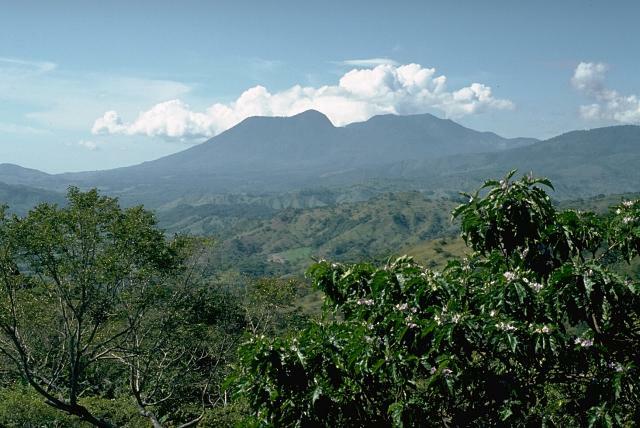 An evaluation of the geothermal potential of the Tecuamburro volcano area of Guatemala. Central Amer Energy Resour Project, LA-11906-MS, Los Alamos Natl Lab, Los Alamos, NM 87545, 37 p.
Janik C J, Goff F, Fahlquist L, Adams A I, Roldan-M A, Chipera S J, Trujillo P E, Counce D, 1992. Hydrogeochemical exploration of geothermal prospects in the Tecuamburro volcano region, Guatemala. Geothermics, 21: 447-481. There is no Deformation History data available for Tecuamburro. There is no Emissions History data available for Tecuamburro. 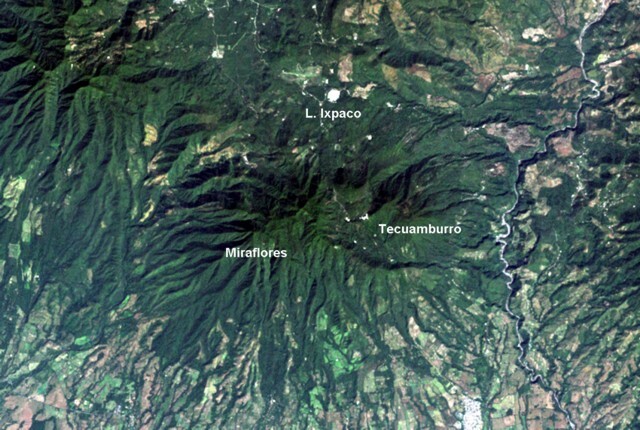 Tecuamburro, seen here from the north, is a small, forested stratovolcano or lava-dome complex of mostly Pleistocene age. The smoother, left-hand side of the elongated volcano consists of younger lava domes that were constructed during the late Pleistocene or early Holocene within a horseshoe-shaped, east-facing caldera. 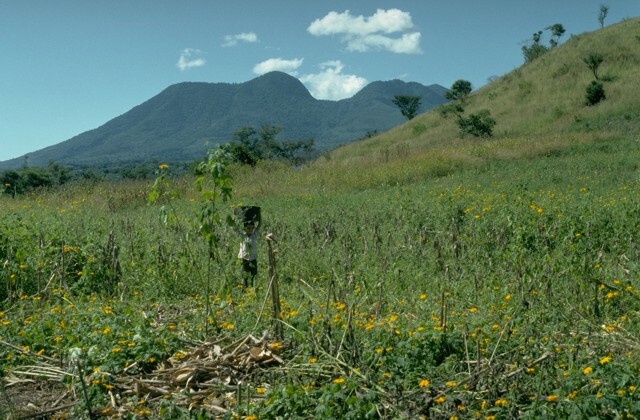 The caldera resulted from structural failure of the older Miraflores stratovolcano (right). A phreatic tuff ring on the NW flank, Laguna Ixpaco, is of Holocene age, and is still fumarolically active. Tecuamburro, seen here from the SE on the Pacific coastal plain, is a small, forested stratovolcano or lava-dome complex of mostly Pleistocene age. Tecuamburro and other lava domes forming the right-hand peaks were constructed during the late Pleistocene or early Holocene within a horseshoe-shaped, east-facing caldera. The caldera resulted from structural failure of the older Miraflores stratovolcano on the left. The latest dated eruption from Tecuamburro formed Laguna Ixpaco, a phreatic tuff ring on the NW flank, about 2900 years ago. The low ridge on the left-hand horizon is the southern rim of a large horseshoe-shaped caldera left by collapse of Miraflores, an andesitic ancestral stratovolcano of the Tecuamburro volcanic complex. Miraflores volcano was formed about 100,000 years ago and collapsed sometime prior to 38,000 years ago. The forested peak at the upper right is part of the compound Tecuamburro lava-dome complex, which was constructed within the collapse scarp. The summit lava-dome complex of Tecuamburro volcano is seen here from the NE along the road from Cuilapa. Four adjacent NW-SE-trending lava domes, the SE-most (left-center) of which is Tecuamburro proper, were erupted within a large horseshoe-shaped crater left by collapse of an ancestral volcano. These domes were erupted less than 38,000 years ago. The Tecuamburro complex was constructed within a 20-km-wide graben whose northern margin terminates against the major regional Jalpatagua fault. Ixpaco crater, a 1-km-wide tuff ring on the NW flank of Tecuamburro volcano, was formed during an explosive eruption about 2900 years ago. This marks the youngest dated eruption of the Tecuamburro volcanic complex. An acidic lake fills the tuff ring, and fumaroles, acid-sulfate hot springs, and mud pots occur around the lake. Colloidal sulfur turns the lake a milky green color. This view is from the north with the forested lava domes of Cerro Miraflores (left) and Cerro Pena Blanca (right) in the background. 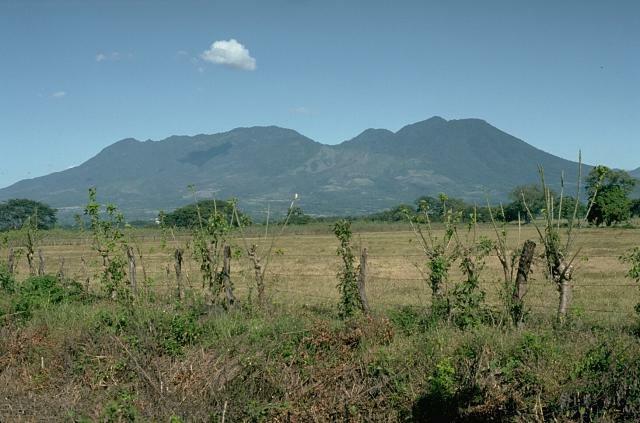 The Tecuamburro volcanic complex has a diverse history. 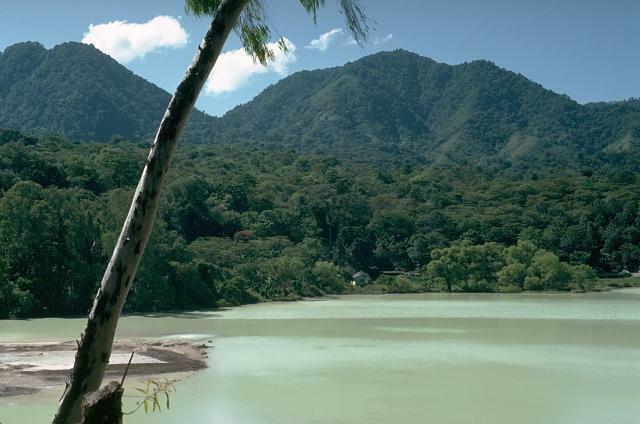 Collapse of the ancestral Pleistocene Miraflores volcano created a large horseshoe-shaped caldera open to the east, producing an avalanche deposit that traveled across the Río los Esclavos (right). The modern Tecuamburro complex, consisting of four andesitic lava domes, was constructed within this scarp. The Laguna Ixpaco crater was created about 2900 years ago within the much larger Chupadero crater of Pleistocene age. There are no samples for Tecuamburro in the Smithsonian's NMNH Department of Mineral Sciences Rock and Ore collection. Large Eruptions of Tecuamburro Information about large Quaternary eruptions (VEI >= 4) is cataloged in the Large Magnitude Explosive Volcanic Eruptions (LaMEVE) database of the Volcano Global Risk Identification and Analysis Project (VOGRIPA).